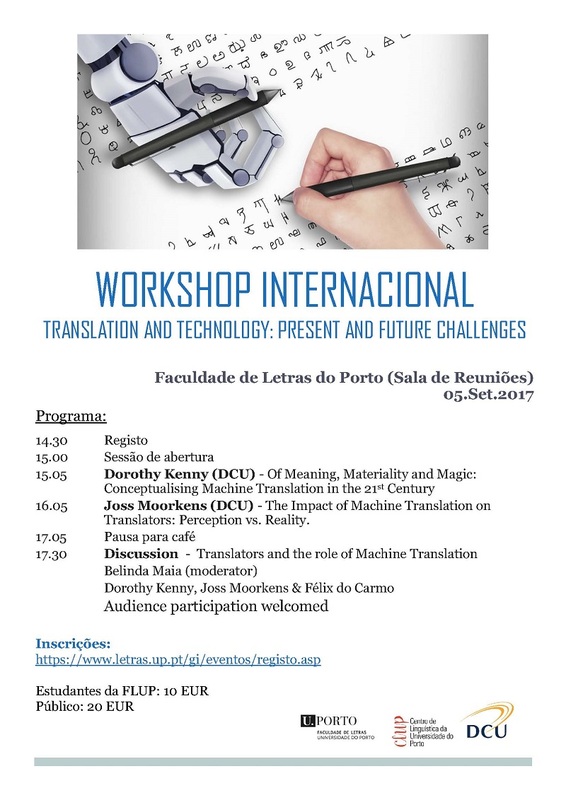 FLUP - Workshop Internacional "Translation and Technology: Present and Future Challenges"
Você está em: Start > Notícias > Workshop Internacional "Translation and Technology: Present and Future Challenges"
Workshop Internacional "Translation and Technology: Present and Future Challenges"
A Faculdade de Letras da Universidade do Porto em associação com o Mestrado em Tradução e Serviços Linguísticos e o Centro de Linguística da Universidade do Porto irá organizar no dia 5 de setembro de 2017 o Workshop Internacional "Translation and Technology: Present and Future Challenges​". Serão intervenientes convidados os Professores Dorothy Kenny e Joss Moorkens da Dublin City University bem como a Professora Belinda Maia da Universidade do Porto. Este workshop tem como destinatários tradutores profissionais, empresas de tradução e estudantes de mestrado que estão interessados na questão da evolução tecnológica no processo tradutivo. A língua de trabalho será o inglês. As inscrições podem ser feitas através do link https://goo.gl/8fWTFX. Dorothy Kenny, BA, MSc, PhD, is Associate Professor in the School of Applied Language and Intercultural Studies at Dublin City University, where she lectures in translation technology, terminology and corpus linguistics. Her publications include: Lexis and Creativity in Translation: A corpus-based study (St. Jerome/Routledge, 2001) and the edited volumes Unity in Diversity: Current Trends in Translation Studies (St. Jerome/Routledge, 1998), Across Boundaries: International Perspectives on Translation Studies (CSP, 2007) and Human Issues in Translation Technology (Routledge, 2017). She has authored numerous refereed articles and book chapters on corpus-based translation studies, computer-aided translation, translator training, and translation theory. She is an Honorary Fellow of the Chartered Institute of Linguists in the UK, and a former Board Member of the European Master’s in Translation (EMT). Joss Moorkens is a Lecturer in Translation Studies in the School of Applied Languages and Intercultural Studies in Dublin City University (DCU) and a member of industry-academia partnership The ADAPT Centre. He is co-editor of a forthcoming book on human and machine translation quality and evaluation (to be published by Springer), and has authored several journal articles, book chapters, and conference papers on topics such as translation memory, user evaluation of translation technology and machine translation, and ethical considerations in translation technology in relation to both machine learning and professional practice. Within ADAPT, he has contributed to the development of translation tools for both desktop and mobile, and he currently leads a Science Foundation Ireland/Enterprise Ireland-funded project to develop an accessible translation tool with multimodal input. Belinda Maia was an Associate Professor at the University of Porto, where she taught from 1974 until her retirement. She was the director of a PhD programme in Human Language Technologies, a PhD programme in Translation, and the Master's in Translation and Language Services, and taught research methodology, computational linguistics, forensic linguistics, English linguistics, terminology and lexicography, and translator training methodology. Her research interests, and those of the students whose theses she supervised, were related to these subjects, several of which imply interdisciplinary cooperation. She published several chapters in books and articles over her career and continues to do so. She was a member of the Board of the EMT - European Master's in Translation Network, to which the Master's in Translation and Language Services belongs. She is also a member of the Scientific Committees of the conferences organized by APL – Associação Portuguesa de Linguística, EPIA – Portuguese Conference on Artificial Intelligence, IAFL – International Association of Forensic Linguists, and PROPOR – International Conference on Computational Processing of the Portuguese Language.